There are two big things Dell needs to do, but other companies do them better. 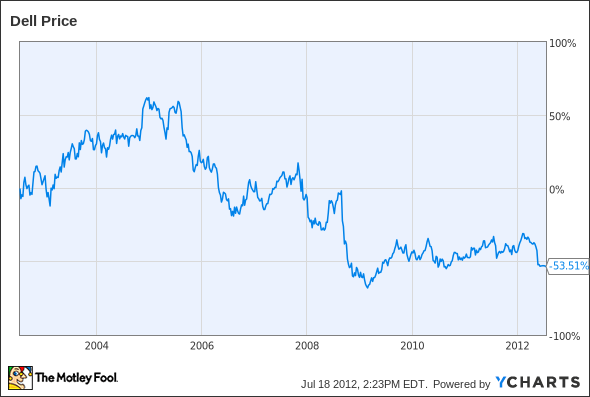 The past decade has not been kind to PC maker Dell (Nasdaq: DELL). After the company’s rise in the 90s, the company has now begun to stagnate, and shares have lost half their value over the past ten years. Dell is actively looking to differentiate itself away from the commoditized hardware business that has become its core, but that transition remains incomplete and uncertain. Here are three reasons investors should sell Dell. Longtime partner Microsoft (Nasdaq: MSFT) made a clear vote of no confidence in its own hardware partners when it unveiled its Surface tablet last month. There’s also a good chance that Dell rival Hewlett-Packard’s (NYSE: HPQ) failed Slate tablet was a large contributor to the software giant’s decision to get into hardware. Dell and HP are the two largest domestic PC makers, and continue to bleed market share to Asian rivals, while overall PC volumes stagnate in the face of tablet adoption. Neither company has any traction in the tablet market. HP’s TouchPad was nothing short of a fiasco, while Dell killed its domestic Streak tablets late last year. When a consumer thinks tablets, Dell and HP are last on the list, and that’s a bad thing. Dell is hoping that Windows 8 will turn the tide, after its attempts with Google's (Nasdaq: GOOG) Android fell flat. Specs for the company’s Latitude 10 Windows 8 tablet have allegedly leaked, which is due out by year’s end. It’s expected to carry an Intel Clover Trail Atom processor and a 10.1-inch display. We still don’t know a whole lot about Microsoft’s Surface, so it’s hard to compare the tablets directly, but if the Surface performs well with consumers, Microsoft may be tempted to expand its first-party hardware, to the chagrin of Dell. Even with a whole slew of Windows 8 devices in the pipeline, Dell’s biggest partner and most critical supplier is about to become a direct competitor. Dell and Microsoft continue to maintain public niceties but, ultimately, actions speak louder than words. Dell effectively has no current domestic mobile strategy. It dipped its Texan toes into the smartphone arena with the Venue and Venue Pro, running Android and Windows Phone, respectively, yet both devices have since gone the way of the dodo (and Streak), at least in the U.S.
We’ve already discussed tablets, or rather, the lack thereof. Smartphones and tablets are the biggest revolution in computing since the dawn of the PC, and Dell has little to no exposure. The company still sells both smartphones and tablets outside of the U.S., but the numbers speak for themselves. Consumer mobility revenue, which includes smartphones and tablets as well as traditional notebooks, fell 10% last quarter to $4.2 billion. Dell attributed this to both declining units and average selling prices of notebooks, but also an "increasingly competitive pricing environment" in emerging markets. The company acknowledged that the consumer shift to tablets and smartphones was impacting its business. Dell has no domestic mobile strategy until Windows 8, and its international one isn’t faring very well. Longer term, Dell continues to make strategic acquisitions to diversify more into software and services and wants to be the next IBM (NYSE: IBM). The problem there, of course, is that IBM is already IBM. You might remember when HP tried to pull this move last year, with the possibility of spinning off its PC business and the acquisition of software maker Autonomy. That certainly didn’t turn out as planned, and HP’s reputation got tarnished in the process. Dell even seems in the midst of an identity crisis. At the height of the controversy surrounding HP, Dell CEO Michael Dell reaffirmed his commitment to the consumer PC business, in an attempt to capitalize on HP’s high profile blundering. Just four months later, after the episode calmed down, Dell exec Brad Anderson would say, "We're no longer a PC company; we're an IT company. Dell's changing very quickly. We are dramatically changing the make-up of our business. It's no longer about shiny boxes, it's about IT solutions." Which is it? To PC or not to PC? If Dell isn’t even clear on its own strategy, how can investors have confidence in a successful transition? Dell looks set to continue underperforming, as its core business languishes and its attempts to transition into the age of mobile computing and IT services aren’t promising. Investors looking to ride the mobile wave or lucrative IT software and services sector should look elsewhere. Fortunately, the Motley Fool has two special free reports for each of these hot sectors. This chip company is powering the next generation of smartphones and tablets from the inside, and continues to gain traction with its design wins. Meanwhile, this enterprise software player is tapping big data as corporations need help analyzing the copious amounts of data that they generate. Both are 100% free.